MAY 10, 2018, JERUSALEM – Last week, Israeli Prime Minister Benjamin Netanyahu held a dramatic press conference, complete with a PowerPoint presentation and stage props. He started in English – a clear nod to the fact that President Donald Trump had a big decision coming up about the future of the nuclear deal with Iran. Yet it was aimed just as much – if not more – at the home front, for Israelis know that Bibi is in deep trouble what with all the criminal investigations percolating beneath him and the huge stack of pending legislation just begging to tear his coalition apart. Most of what the prime minister revealed was not so startling. After all, does anyone really think the mullahs threw away their notes on producing nuclear weapons? Is anyone really shocked that they might still be tweaking some of their calculations about implosions? Is anyone really surprised that they’ve lied about their nuclear program all along? 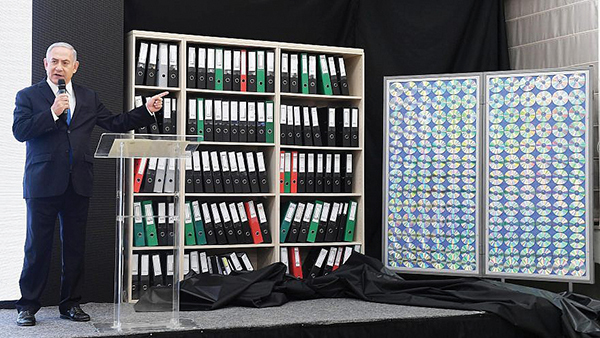 The real news is that somehow, Israeli agents or people working at the behest of Israel were able to locate a nondescript warehouse in an industrial neighborhood of Tehran where the files were being stored, and then bring them back to Israel intact. It meant the Mossad has been hard at work and making important inroads inside Iran. This is a message in itself, an intelligence triumph of the first order, something many fans of Israel probably take for granted despite domestic tarnish that has settled over the country’s intelligence agencies owing to years of foul-ups and ugly interpersonal rivalries. The question is how long Israel has had those files. If it’s been a while, even if only just months, why reveal them only now? The answer to that (aside from Trump’s decision on Iran) can be found immediately to the northeast of Israel, where Tehran has been making its presence in Syria felt more and more, and where strange and powerful nighttime explosions have been rocking air fields, military bases and warehouses. Uncharacteristically, Israel owned up to a couple of those explosions. One took place this past February at an airfield in Syria called T-4, from which it said Iran had launched a drone that penetrated Israeli airspace. At the same time as the attack on T-4, an Israeli F-16 was downed by shrapnel from a Syrian missile. Because it came crashing to earth in Israeli territory in full view of the public, and because its two crewmen had been wounded by the shrapnel (one of them seriously), Israel had to come clean – and it did so in a spectacular way, primarily by loudly announcing, much as Prime Minister Netanyahu did last week (just without the props and PowerPoint presentation) that Iran was now in Syria big-time and Israel would be having none of it. This is a red line whose crossing is a lot easier to prove than that of any red line about Iranian nukes. To demonstrate just how determined Israel is in getting this message out, it only later announced that the drone it shot down had been armed with explosives. If true, the experts who examined the downed aircraft surely found the explosives right away; it was announced only later to make more headlines about red lines and to lay claim to more air time in the news cycles. Following most of the other attacks in Syria (one came just hours before Netanyahu’s press conference), word would be leaked to Israeli and foreign media that the targets had been Iranian missiles being transshipped through Syria to Hezbollah, Tehran’s Shi’ite proxy in Lebanon. Hezbollah has been a major presence in Syria, standing shoulder to shoulder with government troops and pro-Assad militias fighting against rebels. It makes no secret of the fact borne out by Israeli intelligence that back home in Lebanon, it has many thousands of missiles – perhaps many tens of thousands – pointed at Israel, a lot of them capable of reaching Tel Aviv and beyond. Israel has long had its eye on Hezbollah, which Tehran is willing to use to poke the Jewish state. It now wants the world to know that it has its eye on Iran, too, as well as its plan to create a swath of territory running from Tehran through mostly Shi’ite Iraq and an Assad-led Syria (Bashar Assad’s minority Alawite sect can be traced directly back to Shi’a Islam) and into Lebanon, where Hezbollah is not only a potent military force, but also a powerful political party. Right now, a swath like this is the last thing Israel wants rubbing up against its borders, Iranian nuke-cheating or not. Taken together with a brand new law that gives the prime minister and his defense minister the power to go to war over undefined “extraordinary circumstances” without consulting other cabinet ministers, even those in the so-called security cabinet, this was the real message. But Netanyahu made a mistake: He turned it into a show. There was the PowerPoint presentation, a bit too slick and overly pedantic. And there were the props. There was a bookcase full of binders and another full of… well, you couldn’t really tell, for it apparently represented computer discs that would have been full of digital secrets if only he could show us. At first, both were draped with cloth, but the prime minister quickly uncovered them with the flourish of a P.T. Barnum. And he, rather than a highly respected senior intelligence official, was star of the show. He was revealing something not only terribly important, but deeply disturbing. Imagine Donald Trump putting on the same show about North Korea; the seriousness of the matter notwithstanding, wouldn’t you, too, wince in light of the cartoon he’s become? Wouldn’t you wish it was the CIA head or chairman of the Joint Chiefs of Staff up there? You see, Netan­yahu has an image problem. It’s not as readily apparent to many abroad who see him as a spokesman par excellence (and he is), but he has of late resorted to words and gestures – and props – that too often make him look and sound silly. He was smart enough this time not to revert to the Acme bomb that Wile E. Coyote might throw at Roadrunner, a drawing he held up a few years back when informing the United Nations about Iran’s full-speed efforts to build a nuclear weapon. Instead of driving the message home, the silliness made a lot of people roll their eyes, distracting from the urgency of the matter. Certainly, he was the person to be speaking in English last week. He was basically preparing you for Israeli actions in Syria, as well as those that could end up going much farther afield. But he probably turned a lot of people off with his props and bombast. He certainly turned off a lot of Israelis. We know his shtick, which is to frighten us and make us look around to see no one else on the political horizon ready to protect us against the likes of Hezbollah and Iran. Had he taken some time to think about it, letting the head of Mossad or Military Intelligence address the nation would have kept the eyebrows level and the snark factor to a minimum. The eyebrows and snark are the real danger – they make us think about Bibi’s many shortcomings when we should really be sitting up and taking note of the danger just across the border and inside hollowed-out mountains in Iran. They make us ask ourselves whether these claims are true or just another tactic to make us take our eyes off our prime minister’s criminal and political woes. And we wonder whether you see this, too. Lawrence Rifkin is a Jerusalem-based journalist.